Huawei has released a series of images teasing its next flagship handset, the Ascend P8, ahead of its official launch on April 15. Now that all the big boys in tech have outed their new smartphones, namely the Samsung Galaxy S6 and HTC One M9, Huawei has decided it's time to start teasing its own device. 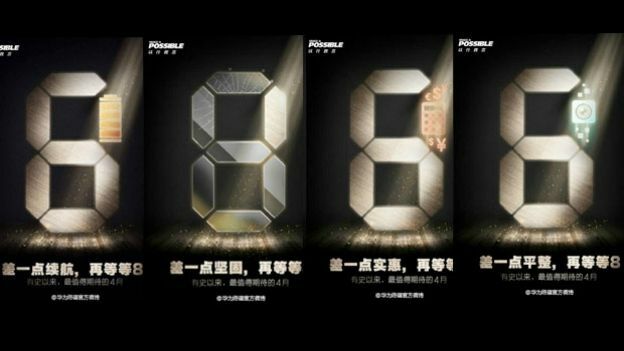 The Chinese manufacturer has been busy online this week, releasing a series of teaser images all focused around the number 8. On top of name-dropping the Ascend P8 moniker, the teasers also hint at what new features the new flagship will bring. The first picture shows the number 8 with what looks like cracked glass at the top and solid glass at the bottom, which suggests the Ascend P8 could arrive with a tougher display. Perhaps it will sport Corning's Gorilla Glass 4 which debuted on the Galaxy S6? We'll have to wait and see. The second image is trickier to work out. The 8 features a calculator and currency symbols, which potentially hints at a reduced price. Other images point to an impressive battery life and an upgraded camera. Rumours suggest we can expect a 13-megapixel snapper along with more shooting features, offering more options than the previous Huawei Ascend P7. This is all slightly speculative though; we'll know everything when the Huawei Ascend P8 officially launches on April 15.